Is there anyone here who didn't at least tear up during that episode? Anyone want to talk about it? The link and my comment are going behind a cut for those who don't like to be spoiled for this sort of thing. On a different topic. My DVR didn't record Days on Thurs or Fri, so I wanted to confirm that there were no eps those days. Thanks! I am so happy that Will is back! And Chandler looks so good, too! I'm caught up on the eps and I thought I'd list my favorite Will scenes so far. What are your favorite scenes so far? I finally got this story done so I can catch up on the eps now! Spoilers: Through the episode that aired Tuesday, November 14. Summary: Sonny’s joy at seeing Will is tempered by Will’s memory loss, but he’ll do whatever he has to in order to convince Will of who he is, even if it means he has to pretend to be okay with Will not remembering him, remembering them. 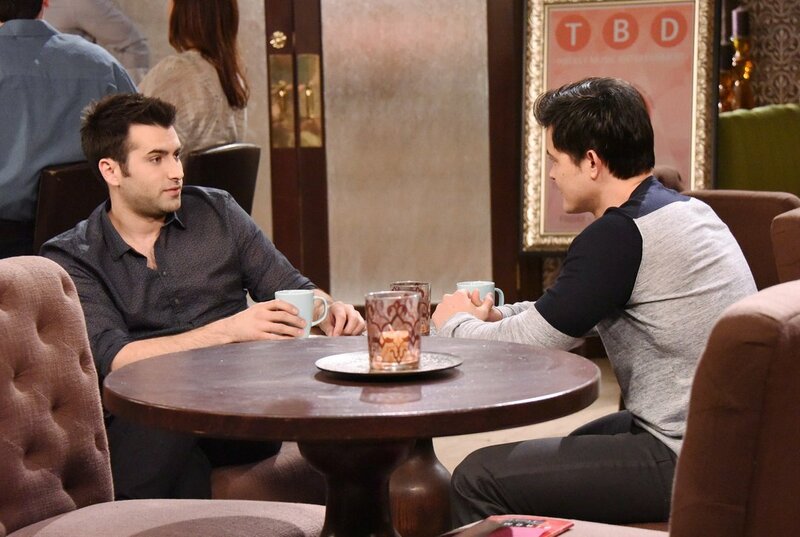 Author’s Note: Canon divergent AU; takes place immediately after the episode that aired Friday, November 10 when Sonny first sees Will in the bar, then goes AU from there. Title taken from the quote below. Disclaimer: Neither Will and Sonny, nor any of the characters from Days of Our Lives, belong to me. Will's storyline dominated today and Chandler was in nearly every scene. I'm not sure I've ever seen as much focus on one character in a single episode. In fact, going back months now, Will has been mentioned by practically every character on the show in one way or another. I think we heard some form of Will possibly being "alive" a hundred times or more. Chandler must have felt immense pressure to deliver and today, he was flawless. Will's scenes with Marlena were heartbreakingly real - just as I expected them to be. I know they will end up being among my favorite Will scenes, past or present. Frankly, the entire cast has been killing it lately and Will's storyline is actually working. This is a link to a video clip on Tumblr. I've just seen that Chandler's first airdate back is September 15th! Hi guys! Very exciting that Chandler will be back, since he brings an authenticity and pathos to Will I've rarely seen in soaps. I'd say he's my favorite soap actor of all time. Anyway, I never did watch Days as a whole. Back before Will died, I bounced around a couple of YouTube channels that featured only Will/Sonny clips whenever one or both of them were on. Most recently I followed the channel Paula M when she got tos'd from YT and went over to Dailymotion as PaulaM2. I've fallen behind on keeping up with clips the past couple of months, and now it seems that channel no longer exists either -- probably tos'd again. I'd really like to catch up on the past couple of months and stay on top of Sonny and Paul from now on, since Will will be back so soon. Does anyone know another consistent clip source? So I thought it might be fun to speculate the "how" of Will coming back from the dead. I thought we could celebrate the news of Will's/Chandler's return listing various ways they could write him back into the show. No idea is too out there - remember that Marlena was once possessed by the devil, so this show is willing to think outside the box. CHANDLER'S BACK!!!!! WILL'S BACK!!!! LET'S DO THIS!!!!! Not even putting this below a cut. The actor who helped Days of Our Lives set a major milestone as Will Horton is re-joining the cast of the NBC sudser. Chandler Massey — whose character kissed another man in 2012, a first for DOOL — is coming back to Salem to reprise his popular role, EW has learned exclusively. Massey left the soap in 2013 after winning three Daytime Emmys for playing Will Horton. Massey returned to work in the last month. His first episode will air sometime in September. Now, we know what you’re thinking: Will died in 2015, right? Sadly, the DOOL folks aren’t saying how his character will mysteriously surface … for now. So stay tuned. Massey first joined the sudser in 2010. His character came out of the closet a year later. In 2012,Will kissed a stranger named Neil (Jesse Kristofferson) at a party, marking the first time the NBC show featured a buss between two men. DOOL had teased the possibility the year before with the addition of Freddie Smith (90210) as a young gay man named Sonny. Sonny's back... And it's not a cameo! In the new issue of Digest, Freddie Smith talks about his Salem comeback. The Daytime Emmy Award-winning actor first appears on July 26. “You’re going to see Sonny interacting with everyone,” previews Smith. And look for him to stick around. “I’ll definitely be back for awhile. I’m excited,” he shares. To read more pick up the new issue of Digest, on sale now. I wrote this story for the smallfandom big bang and I just posted it. This community was mentioned to me and I thought I'd post my fic here too. I'm not sure if anyone is still following this though. Summary:In a moment of insanity - during one of the many arguments Nick and Will have about Arianna's custody - Nick stabs Will. This is what comes immediatly after. Author's note Written for the smallfandom Big Bang. I've loved Days of our lives for years and Sonny/Will is both my OTP in the show and one of my all time favorite OTP's. I hope someone enjoyes this story.I'd like to thank spikedluv for being my beta. Thank you. (It should be noted that any mistakes that are left are completely my own.) Also thanks to knowmefirst for the art created for this fic. It's great and I love it. This is set in the first half of 2014. Everything that follows after it (it's set around the time that Nick Fallon dies) doesn't happen naturally. Also, it should be noted that while this is set during Guy Wilson's time as Will Horton, Chandler Massey will always be Will to me. (Also, as a sidenote, I've never been very good at summaries. )Disclaimer: I don't own anything, all the characters belong to the writers and creators of Days of our lives. Hey look! A gay guy! Er... I mean, look! Paul as sommat to do... Or have done to him...? Whatever. He's still pretty. *Knock, Knock, Knock...* Anybody still out there? Well, SUPRISE!!! There's actually some NEW Will and Sonny news!!! First up, Is Chandler Massey Returning to the role? Second up, Freddie Smith spotted on set a second time.